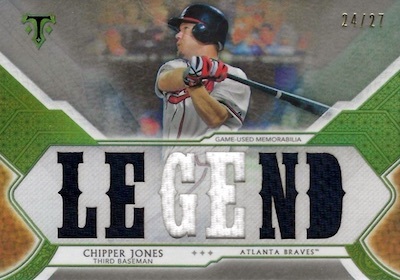 No matter how you feel about the brand, TTT always brings the hits, and 2018 Topps Triple Threads Baseball forges ahead with another relic-filled MLB release. The overall format remains unchanged from 2017, with two autographs and two relics per box. Those buying by the case can look forward to the guaranteed triple autograph relic and one-of-one autograph relic. Displaying an ornate design, the 100-card base set in 2018 Topps Triple Threads Baseball goes to another level with refined parallel colors. For example, it's not green, it's Emerald (#/259). Other numbered versions include Amethyst, Amber (#/199), Gold (#/99), Onyx (#/50), Sapphire (#/25), Ruby (1/1) and the one-of-one Printing Plates. Each master box contains six base cards and four base parallels. 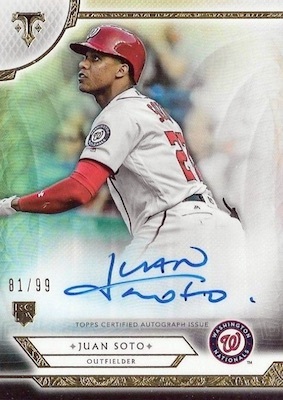 Although most signed cards in the 2018 Topps Triple Threads Baseball checklist also offer swatches, the Rookie Autograph line is the exception. In addition to the numbered base version, there are Emerald (#/50), Gold (#/25), Sapphire (#/10), Ruby (1/1), and White Whale Printing Plate (1/1) editions. More first-year stars and other up-and-coming players appear in the Base Rookies & Future Phenoms Autograph Relic set, with each card limited to 99 copies. Parallels here include Silver (#/75), Emerald (#/50), Onyx (#/35), Ruby (1/1), Wood (1/1) and White Whale Printing Plates (1/1). 2018 Topps Triple Threads Baseball also features Triple Threads Autograph Relic cards in base and parallels (#/18 and less), and the Unity Single Auto Jumbo Relic cards, with numbering no higher than 99. Showcasing a trio of signatures and swatches per card, the Triple Threads Autograph Relic Combo insert is a case hit. These are limited to 36 copies with several low-numbered parallels. A rare instance where three is not the common theme in Triple Threads, the Autograph Deca Relic Book (#/10) cards contain 10 memorabilia pieces from one player, while Autograph Deca Relic Combo Book (#/5) includes one relic from 10 different players. New for 2018, the Windows into Greatness Autographed Relic Book design utilizes a three-panel booklet for one player. All three booklet options come as Gold (#/5 or less) and Ruby (1/1) parallels, as well. Numbered to three or less, the rarest autographs in TTT make an appearance. Choices include Jumbo Plus Autograph Relic Book (#/3) and Letter Plus Autograph Relic Book (#/3), each with one-of-one Ruby parallels. Although not a booklet, the Cut Above Cut Signature cards only have one copy apiece, as do the Dual Cut Above Autograph Book cards. And, of course, 2018 Topps Triple Threads Baseball piles on the relics. All numbered to 36, the main lineup consists of Triple Threads Relic, Legend Relic, Players Weekend Relic, and Relic Combo, with each available in Silver (#/27), Emerald (#/18), Gold (#/9), Sapphire (#/3), and Ruby (1/1) parallels. All-Star Patches, numbered to nine, have only the one-of-one Ruby parallel. Speaking of the All-Star Game, TTT brings more heat via the one-of-one Jumbo ASG Patch Book, Jumbo Sleeve Team Patch Book, Laundry Tag Book and Majestic Logo Patch cards for the AL vs. NL matchup. Although not specific to the All-Star Game, there are also Jumbo Plus Relic Book (#/3), Letter Plus Relic Book (#/3), Bat Knobs Book (1/1), Jumbo Patch Combo Book (1/1), and Threads Jumbo Letter/Number/Logo Book (1/1) cards. 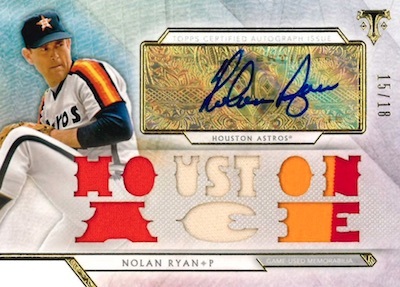 Refusing to quit, 2018 Topps Triple Threads Baseball adds Deca Relic Combo Book (#/10) and the new Windows into Greatness Relic Book (#/10) cards. Lastly, displaying a large swatch, the Unity Jumbo Relic cards come in a base version numbered to 36, plus parallels limited to 27 and less. Buy 2018 Triple Threads boxes direct from Topps for $240. PARALLEL CARDS: Amethyst #/299, Emerald #/259, Amber #/199, Gold #/99, Onyx #/50, Sapphire #/25, Ruby 1/1, Printing Plates 1/1. 42 cards. Serial numbered #/99. Buy 2018 Topps Triple Threads MLB autographs on eBay. 263 cards. Serial numbered #/18. 84 cards. Serial numbered #/36. 86 cards. Serial numbered #/99. PARALLEL CARDS: Gold #/3, Ruby 1/1. 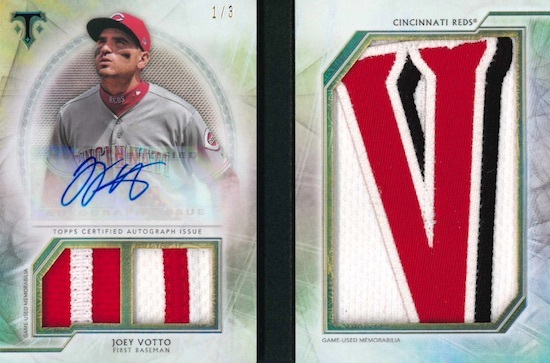 Buy 2018 Topps Triple Threads MLB relics on eBay. 164 cards. Serial numbered #/36. 22 cards. Serial numbered #/36. 11 cards. Serial numbered #/36. 248 cards. Serial numbered #/36. 19 cards. Serial numbered #/3. 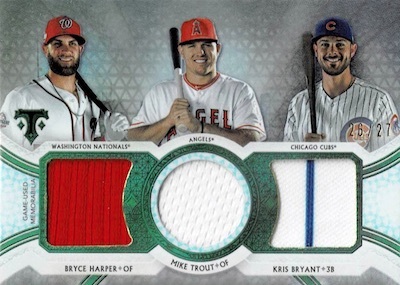 View the full 2018 Topps Triple Threads Baseball checklist spreadsheet. We’re done, Topps. I’m sick and tired of your sticker autographs and redemption nonsense–even in PREMIUM products such as this–and your flooding the market with way too much mediocre trash, especially this month. You are crashing the market. Another good looking LICENSED product from Topps. goood one! 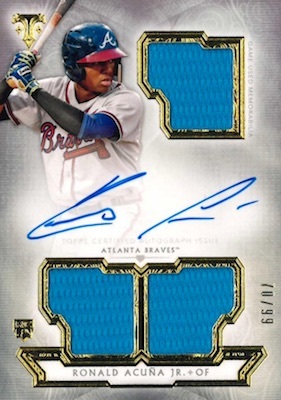 woulda been nice to see some of those kind of hits on an Acuna or Torres or Buehler..
the common cards in this product really become disappointing and mostly un-necessary when you see all the other Hit Only high end products. If you liked Tripple Threads in the past, you will like this, but it won’t surprise you. I do like the selection of autos this year. I don’t feel like the design was updated as much as it could have been. 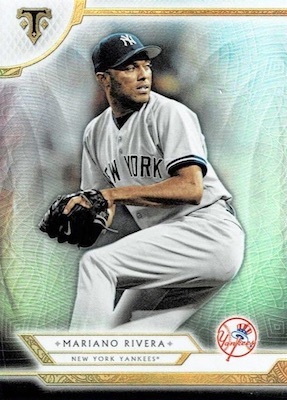 All-in-all a solid product, but Topps does need some help in the creativity department. I think having the sole rights to logos has made them a bit lazy. Card #85 Mike Piazza appears to be a mistake. #85 is Justin Smoak. The TTT base card I saw for Piazza is #85. Are you talking about Tribute? Prefer any Bowman product over this. Triple Threads Deca Autographed Relic Combo Book Card Ruby Parallel ARC-1 of: Hank Aaron, Ernie Banks, Johnny Bench, Kris Bryant, Derek Jeter, Clayton Kershaw, Buster Posey, Cal Ripken Jr., Nolan Ryan, Mike Trout. Needless to say I about crapped myself. May you all pull Monsters. Busted a Master Case last night. Hit Red Sox Deca Auto booklet, Othani Auto relic, White Whale Auto Schwarber, Votto 1/1 Jumbo Plus Relic, Juan Soto Auto Gold, Mets 3/3 Triple Auto. Lots of other autos of course. Probably best case we have opened. The issue is with number or breakers, people panic, cheap sale on EBay so it’s tough to recoup. 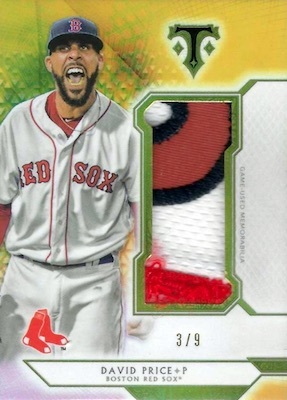 If you hit a monster, like Red Sox deca booklet, not many buyers in that price range for resell. Still, enjoyed busting. $3500 cost. If we recoup, will do another. Just trash. For $200 you should get something other than nobody autos you’ve never heard of. Even the relics are from terrible players nobody wants. I gave it 3 tries, same result every time. To much money to gamble with.